With the increase of Veld Fires in the Ward 2 area over the last few years it had become increasingly obvious that a concerted effort is to be made in reducing the threat these hold to the whole of the community. The formation of a Ward 2 Fire Prevention Association is being planned to address this critical issue. In conjunction with all the major role-players the following is being done to reduce and ultimately curb the threat of Veld Fires. 1. The preparation and maintenance of a Firebreak Network for the whole ward 2 area. The purpose of a firebreak is to provide an area of reduced fuel load which will reduce the intensity of a fire and therefore allow for more effective combating, serve as a access route to fires as well as a line from which a back burn can be started. 2. Education drive to increase the awareness of the devastating impact Veld Fires have on our Natural Environment and Economy as a whole. 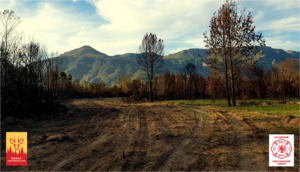 To this end a Ward 2 Firebreak Document (Firebreaks – Ward 2) was provided to Theewaterskloof Municipality of the proposed firebreaks for the area. It is pleasing to note that TWK have adopted this proposal as part of there overall planning and will be implementing these over time as funds become available. 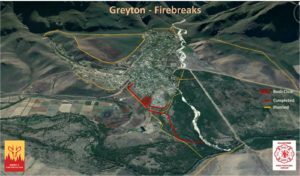 The firebreaks around the lower end of Greyton have already been started. This included the clearing of dead trees and fuel load in areas around the Country Village. A very big thank you to Johan Viljoen of TWK for his assistance and contribution in this project.